The Maryland Hunt Cup may be the closest thing we have in the States to the Grand National. The four mile race includes 22 timber fences, with several of the jumps approaching 5′. The 121st running will take place this Saturday, April 29th. 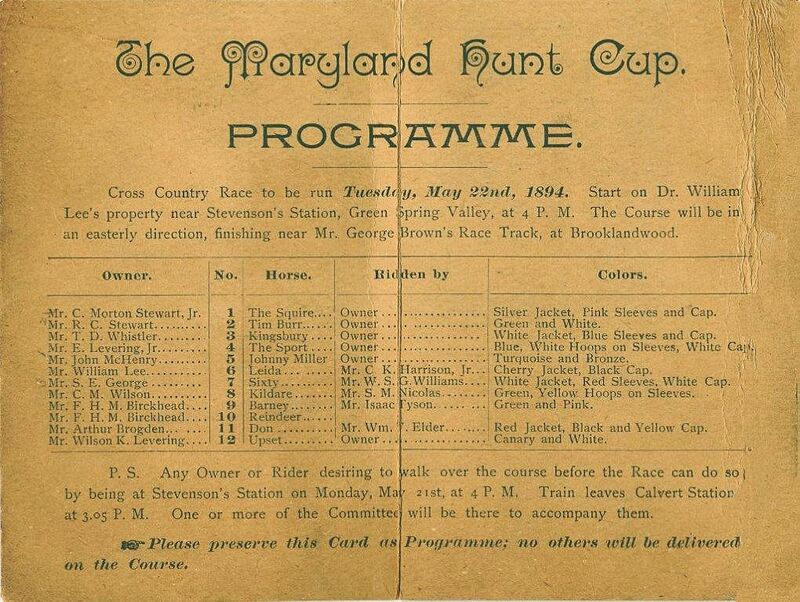 The first Maryland Hunt Cup was run in 1894 and was won by Johnny Miller owned and ridden by John McHenry. The race began in 1894 as a competition between the Elkridge Fox Hunting Club and the Green Spring Fox Hunting Club to determine which hunt had the best horses. The first year entries were limited to members of the two hunt clubs. The next year it was opened up to horses owned and ridden by members of any recognized hunt in Maryland. In 1903, it was expanded to horses owned and ridden by members of any Hunt Club in North America. Today, there is no restriction on where the horses and riders come from. The only thing that has stayed the same is that the jockeys must be amateur riders.